It’s Not Just a Theory Anymore. A Huge Piece Of Antarctica Has Fallen into the Ocean. One of the largest icebergs ever recorded broke off Antarctica’s Larsen C ice shelf earlier this week, according to satellite pictures and scientists who monitor such things, permanently altering the coastline of our planet’s frozen continent. Twice the size of Long Island and packing a trillion tons of ice—fully melted, that’s enough water to fill Lake Michigan—the newly birthed iceberg seems like a perfect symbol for our overheating world. But there’s a more complex story at play. We’re in the weird middle phase of climate change where at least some level of irreversible change has already been locked in but hasn’t happened yet. You might be thinking: Should I have moved to the mountains of Colorado yesterday? Well, this one iceberg itself (likely to be named A68) doesn’t mean much on its own. Its “calving” (as scientists call it) was likely mostly natural, and it was already floating, so it won’t contribute significantly to sea-level rise. And there are other regions of Antarctica that contain vastly more ice. But now the clock could be ticking on the collapse of Larsen C itself, kicking off one of the most potentially important natural science experiments in human history. By closely watching what happens at Larsen C, we’ll be able to learn more about what might happen to the rest of Antarctica in our lifetimes, and refine sea-level rise projections for the coming decades. The Larsen C shelf is a floating mass of ice located about midway down the Antarctic Peninsula, and the fourth-largest on our southernmost continent. The peninsula itself is a frozen finger of land that extends northward toward the southern tip of Chile; it’s a hotspot of climate change. Scientists have been monitoring this area for years, watching a crack in the ice shelf slowly progress toward the sea. In the past few months, the rift dramatically accelerated—leading to close scrutiny of every satellite image taken of the area in recent days. Larsen C’s newborn offspring carries enough ice to coat the entire United States in a 4.6-inch thick skating rink, but its impact on sea levels will be negligible; ice shelves are already-floating extensions of inland glaciers that have moved out over the ocean. Calving (yes, just like momma cow giving birth to a calf) is a natural event that happens regularly on ice shelves, and it’s necessary to balance out the snowfall that the parent glaciers receive. As long as the parent ice shelf remains stable, A68 should have no measurable impact on the rest of the planet, other than posing a hazard to ships in the South Atlantic, potentially for years to come. Which isn’t to suggest that there’s nothing to worry about. In the coming years, we may look back on days like today as a warning sign: Antarctica is changing, and fast. These giant icebergs tend to stick around. The largest ever measured, dubbed B15, broke away from its Antarctic ice shelf back in 2000. It was nearly twice the size of this week’s berg. Giant chunks of it were still seen floating in the Southern Ocean two years ago. There will be many more like A68 and B15 in the near future. As for Larsen C, the ice shelf is expected to remain stable for now—though at its smallest size on record. Sophie Berger, a Phd student at Université libre de Bruxelles whose work focuses on high-resolution studies of ice-shelf stability in Antarctica, says that most of the iceberg belonged to the so-called “passive zone” of Larsen C, a natural region of ice outflow. When icebergs calve from these zones, “nothing special” happens, she says. A tiny part of the new iceberg, though, was connected to one of Larsen C’s grounding anchors—meaning that Larsen C’s parent glaciers will need to be monitored in the coming weeks and months for signs of acceleration, a foretaste of what could eventually be a complete collapse of the 10,000-year-old structure. If that happens, climate change would very likely play a role, and the birth of A68 may be viewed as one of the mix of natural and unnatural events which set the process in motion. We’re in the weird middle phase of climate change where at least some level of irreversible change has already been locked in but hasn’t happened yet. Recent studies, including the one by Trusel, point to the inherent instability of the entire Larsen C ice shelf under continued warming scenarios. What appears stable now won’t be soon. Even if A68 has no long-term effect on Larsen C, a complete collapse of the ice shelf could come by mid-century if greenhouse gases remain relatively unabated. With that in mind, the calving of a superberg this week is best viewed as a natural event embedded in an unnatural context. The birth of a superberg at Larsen C is a “wakeup call,” Trusel says. Although other parts of Antarctica are vastly more important in terms of their capacity to kickoff rapid sea-level rise—Trusel points especially to the Thwaites Glacier in West Antarctica, and Berger’s work focuses on the King Baudouin Ice Shelf in East Antarctica—it’s what scientists will learn at Larsen C that could provide priceless advanced warning before those other ice shelves start to crumble. By all accounts, if we continue on our current path, there will be much, much larger calving events than the one this week. As impressive as it is, the 277 cubic miles of ice contained in the breakaway chunk represents a puny amount compared to what remains on our planet’s frozen continent—and vulnerable to melt in the coming decades. For scientists studying Larsen C, the main goal is to learn as much as they can about what happens when an ice shelf breaks apart—in real time—so they can better diagnose the signs of collapse in other, more consequential parts of the continent. It will help them refine their models of complex and poorly understood aspects of ice shelf melt. 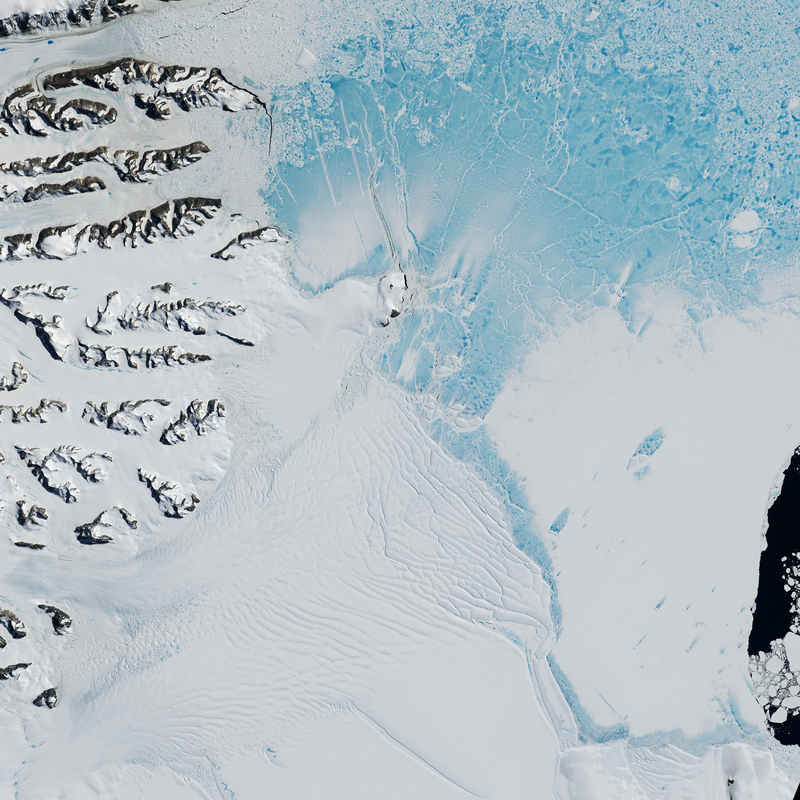 Scientists have just one other example of ice shelf collapse in recorded history: the breakup of Larsen B in 2002, which mostly caught scientists by surprise. After an exceptionally severe melt season, the majority of the ice shelf catastrophically crumbled in just a few weeks that summer, so there wasn’t enough time for a detailed survey in person or by satellite. Using a space-based radar system onboard the European Space Agency’s Sentinel-1 satellite, scientists will continue tracking the progression of the now-smaller Larsen C for years. Burger talks excitedly about the data that’s already streaming in, including the fact that the orbits of some key satellites have been modified to maximize the time spent over Larsen C.